BOSTON (Nov. 23, 2013) – Big Six Entertainment closed its 2013 season on a strong note, featuring its best top-to-bottom card of the year, tonight at The Royale Nightclub Boston (formerly The Roxy). 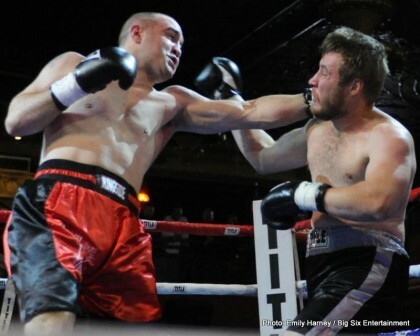 In the main event on “Royale Rumble,” presented by Big Six Entertainment in association with Danny Kelly Promotions, “Irish” Joey McCreedy (17-6-2, 6 KOs) won a unanimous six-round decision over Steven “Too Sharpshooter” Tyner (3-13-2, 2 KOs). McCreedy, fighting out of the same hometown as “Irish” Micky Ward (Lowell, Mass.) and his trainer Dicky Eklund, plans to fight as a super middleweight in 2014. Irag War veteran Chris Traietti (14-3, 10 KOs), fighting out of nearby Quincy, decked Randy “The Rattler” Campbell (3-10, 2 KOs) in the second round. Campbell’s corner stopped the fight when the Ohio fighter was unable to continue after three rounds. Traietti, who notched his fifth straight victory, defeated Campbell 2 ½ years ago by way of a six-round majority decision. Lawrence (MA) heavyweight prospect Alexis Santos (12-0, 10 KOs) fought six rounds for the first time in his professional career, winning a unanimous decision over veteran Kevin Franklin (4-8, 1 KO). Santos had stopped his previous eight opponents. The game Franklin has been stopped only once, by undefeated contender Bryant Jennings. Brockton welterweight (MA) Antonio Chaves Fernandez (4-13-2) upset Stoneham (MA) Greg Vendetti (4-1-1, 2 KOs) by way of a majority six-round decision in a rematch of their four-round draw this past July at the same venue. In a battle of former world title challengers, Marshfield (MA) junior middleweight Aleksandra Magdziak Lopes (10-2-1, 1 KO) and “Notorious” Nicole Woods (11-2-3, 3 KOs) fought to a six-round majority draw. Lynn (MA) welterweight “Speedy” Rashidi Ellis (3-0, 2 KOs), a 2012 National PAL champion, outclassed Oscar Diaz, of Hartford, en route to an impressive win by first-round technical knockout. Ellis dropped Diaz four times, the last resulting in the referee halting the fight. Joey McCreedy(15-6-2, 6 KOs), Lowell, MA 174 lbs. Judges: John Madfis, Leo Gerstel and Ken Volovick.